Choosing the right paper finish for your print marketing is important. Whether you are creating a printed brochure, leaflet, direct mailer, business card or poster, it is important to choose the right paper for your print marketing project. The type of paper and finish you choose for your print marketing can alter the overall appearance of your printed materials and can affect the way your customers perceive your business. When choosing the paper and paper finish for your print marketing project, you have three choices; uncoated, gloss and silk finishes. Choosing which one is right for your project will depend on many things. Understanding the difference between the options available is a good starting point to help you determine which is the best suited. As you may expect a gloss finish will give your printed materials a shiny sheen and can help make your imagery stand out and appear more vibrant. Gloss finishes work well with posters and leaflets thanks to its eye catching vibrancy. Posters and leaflets often rely on catching the attention of people as they are walking by, therefore using a gloss finish could help your printed materials stand out. It is important to mention that gloss finished print media can become difficult to read in bright light, as the finish can produce a glare that can make content hard to see. For this reason, it is important to consider where your print media will be placed when choosing a gloss finish. Silk finishes are as vibrant as gloss finishes but without the shiny finish that can cause glare in certain lights. Being less shiny makes silk finishes less eye catching, but does mean they aren’t as affected by glare. Silk finishes can be great for text heavy print media such as brochures, detailed leaflets and direct mailers as they are delivered directly to recipients and rely less on attracting attention of passers-by. Silk finishes can make your brochures, leaflets and direct mailers appealing and easy to read and can give your print media a good quality feel. Silk finishes are a popular choice for commercial print media as it can be more versatile than a gloss finish. Uncoated finishes can lack the smoothness and vibrancy of gloss and silk finishes, but they are harder wearing and remain in good condition for longer. Uncoated finishes are less likely to pick up dirt and finger marks the way that gloss and silk finishes can. 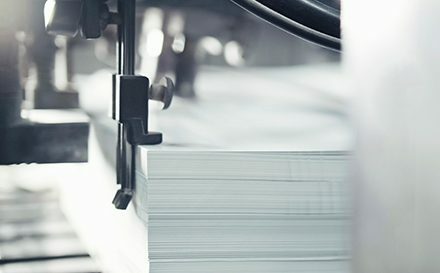 Print media that contains vital information and is likely to be kept for a long period of time are better suited to uncoated finishes as they will stay in good condition and will be kept by the recipient. Uncoated finishes have a perception of being high quality and luxury, making them a popular choice for hotels, health spas, retailers and other high-end businesses wanting to portray a feeling of luxury and professionalism.